This weekend was a bit of an odd one, because at least for me it centered around recording our “Games of the Year” show on AggroChat. This is generally speaking a huge ordeal given that our show is made up of six very different minded people. Back during the days when we had four regular hosts it was less of a proceeding but now that we essentially have six people each picking three games a piece… that means we wind up talking about 18 games, which as it turns out divides neatly into two 9 image panels. The above image is the first of these and serves as the backdrop for our normal show card of sorts, however with the text over it you can’t necessarily make out all of the images involved so I decided to post it here. You can as always find the show on AggroChat or my method of choice for sheer simplicity of listening… YouTube. The reason why this largely dominated my weekend is because we ultimately recorded two podcasts that were both two hours long before I set down to edit them. Post edits they both clock in around an hour and twenty minutes, which really is shocking given that I did not actually time anything out in an attempt to make them work as relative set pieces. I guess however if you set out to record nine games per show… the end result comes out fairly evenly. I did make an attempt to shuffle the deck in such a way as to put the games I thought we would most likely talk the longest about divided evenly among the shows. So we recorded from 8 pm CST until just after midnight, and then I got up around 7:30 Sunday morning and edited until 12:30… and as a result every other element of the weekend felt like it was shoved to one side or the other. Of course all of this madness has a purpose since the double episode is timed perfectly to cover the absence of myself and Ashgar as we go to Pax South. Now in theory Grace, Kodra, Tam and Thalen could record without me… but that would mean I had the forethought to have the mess that is our show in a state that I could easily hand over the reigns to an understudy. I have not planned ahead that far, and while I do have a series of Audacity and Photoshop projects to speed up the process… I am not sure if I could even properly explain what exactly I do each week. It is my hope however that I managed to not only publish yesterday, but also schedule everything else to publish next Sunday while I am driving home from San Antonio. Staging a publish to happen without me is always a fraught thing for me… because so rarely does it actually work as intended. Even if it does… I am literally stressed beyond reason until I see the tweets show up in my timeline from the publish process actually doing its thing appropriately. In the grand scheme of things however… it is not the most important thing in the world… but it is important to me. As far as gaming went this weekend that was equally scattered. 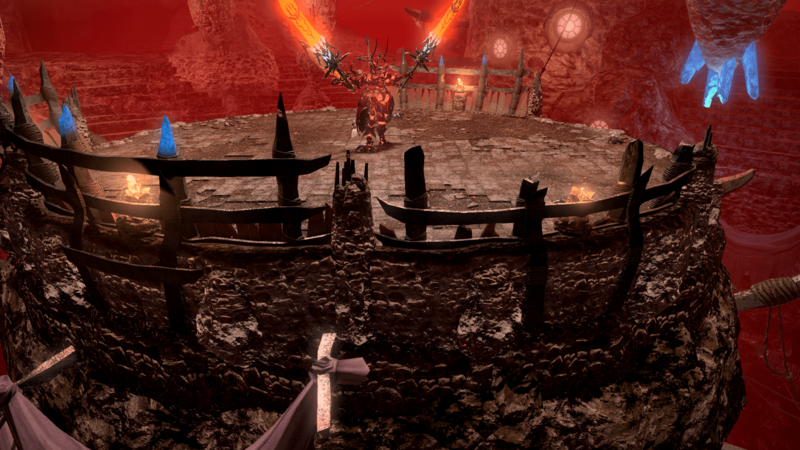 I patched up Final Fantasy XIV and made it far enough to hit the first instance gate, before ultimately walking away. Similarly I patched up Wildstar, created a Chua Warrior and played to around level seven before once again walking away like a bored child. As far as gaming that managed to last for more than an hour… we had World of Warcraft where I finally hit 35 points on my Protection Artifact and started pushing up Fury instead. I have gotten back in the habit of logging in each day to do my Emissary quest because now there is also a potential legendary upgrade waiting at the end of the grind. I started doing my Time Walking dungeons… but only managed to make it through the first one tanking it before once again wandering away. The game that seemed to stick the hardest was Elder Scrolls Online where I completed a good chunk of Malabal Tor, a zone where I am already completely enthralled by the storyline… even though it involves largely nothing but elves and their internal politics. I’ve decided that the Bosmer are what it takes to make me really enjoy Elves. I am really enjoying the whole lore regarding the Green Lady and the Silvenar, and I guess in truth that was an aspect of the lore that I had either forgotten or ignored in playing other Elder Scrolls games. I even managed to have a few emotional gut punches last night, when I lost characters that I actually really liked during one quest chain. In truth all I want to do right now is hide in my blanket cocoon on the couch and play more ESO, but that said I do want to at some point get a Mythic+ in for the week since I have a +5 Maw of Souls key. Over in World of Warcraft, there has been an item that has lovingly started to be referred to as the Friendship Moose…. and there are good reasons behind it. The mount itself is pretty damned majestic, and makes me feel like Santa Claus when I ride it. It comes from getting the Ahead of the Curve achievement for Heroic Archimonde…. well in truth Archi drops a quest but same basic difference. The reason why it has become known as the friendship moose is the fact that there have been an extremely large number of people in the WoW Community who are going out of their way to try and get people the mount. To the best of my knowledge it was originally @Thomicks that started the #FriendshipMoose hashtag, and then it kinda just went out of control from there. I know @Zelse007 for example has been really knocking these out and as of last night he has gotten 639 Folks their moose. I won’t lie that the thought of getting a spiffy mount is partially what drove me back into raiding in World of Warcraft recently, but more than anything it was to be able to hang out with Horde friends that I had never really raided with. Quite honestly I never expected to get the Reins of the Grove Warden. The thing is… I have some really amazing friends. Earlier in the week I was pinged by Damai to see if I wanted to join in with his raid for a farm run. The plan was to clear a bunch of bosses on Thursday and then pop in really quickly early in the evening on Saturday and take down Archimonde. Generally speaking I cannot participate in this raid because it happens to coincide almost exactly with our podcast recording session. However this time they planned on being in and out of the raid roughly two hours before our podcast was set to go. I ultimately had to beg off on Thursday, because I kept going into uncontrollable coughing fits, but I was however able to attend yesterday…. which was good enough to get me a moose. I was carried extremely hard last night, the above image is of me being the only dead member of the raid…. from when I tried to run my fixate to the edge and happened to run right in between two folks firing their lasers. 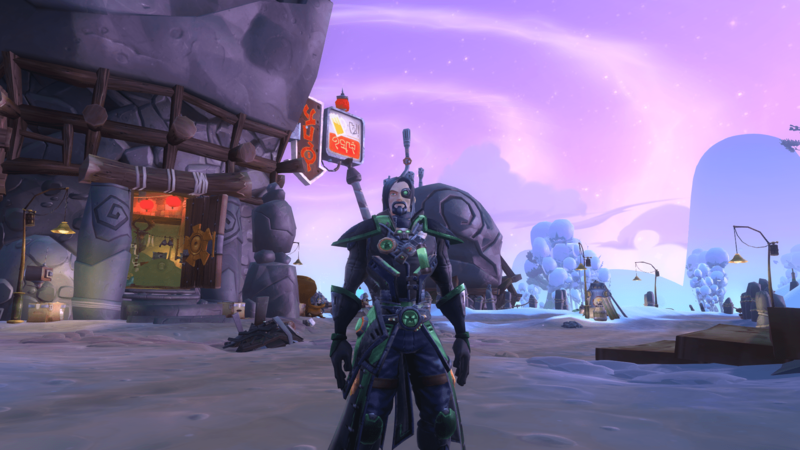 Not only did I walk away with a moose but I also picked up a couple of sweet upgrades, one of which is REALLY amazing for my special snowflake Gladiator spec [ Worldbreaker’s Resolve, World Ender’s Gorget]. I gotta say I am happy beyond reason… because I absolutely thought this was far beyond my reach. I want to give a special shout out to Damai, Errya, Pugnodeum, and the rest of the Praetorian Guard crew for dragging my but along. So now that the warm and fuzzy bits are out of the way… I have to tell you that right now I am feeling like a complete and total failure. Sure being the only person to die on Archimonde should have done that already, but this is something different. We’ve been recording AggroChat for a little over two years now I believe, and during that time we have missed two episodes. This week being the second episode, and for the most part…. this time is completely because of me. While raiding last night, I was on listen only mode because I quite honestly had no voice to talk with. Throughout the day yesterday, as it went on my voice kept getting weaker and weaker until the point where I simply became a squeaky whisper. On top of this… Tam is out of pocket this week, Grace is out of pocket this week… and yesterday was Kodra’s birthday… leaving it up to Thalen and Ashgar to hold up an entire show. As a result throughout the day we simply decided to call it, and I really hate the fact that it was my fault for doing just that. This crud that I have picked up is driving me insane… I am so ready to be “better” but as the weeks go by it keeps dragging on. I know last week when I went ahead and recorded… it was probably a bit of a set back. Because prior to last weeks show I was feeling a bit better…. and then afterwards I was pretty much dead to the world for a few days. What is killing me the most is that when I am in this condition I just don’t want to do much of anything. As a result I have been focused heavily on Elder Scrolls Online, which is a game that I am largely playing by myself. Sure there are a handful of awesome people playing with me like Ammo and Sol, but even then my interaction is mostly that of answering the sort of questions that new players have…. and not so much active grouping. I can zone out and zone into the storyline… and as a result I am probably enjoying it more than I have since I first played alpha. 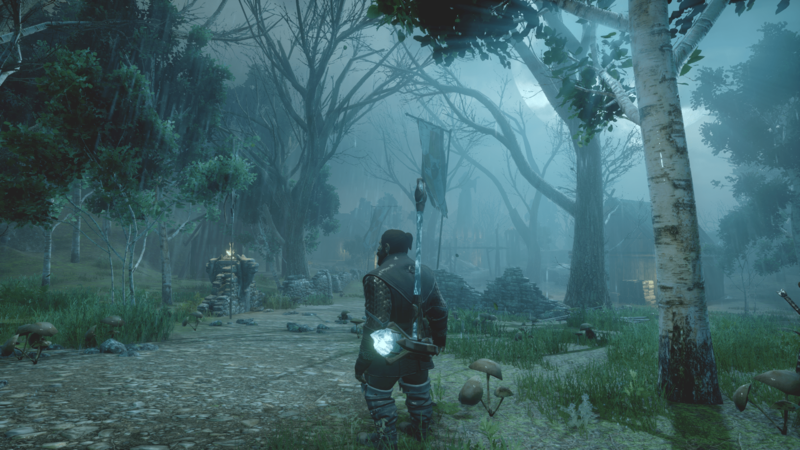 Part of me wants to at least push through the rest of the Aldmeri Dominion content before resigning the game to the back burner again. 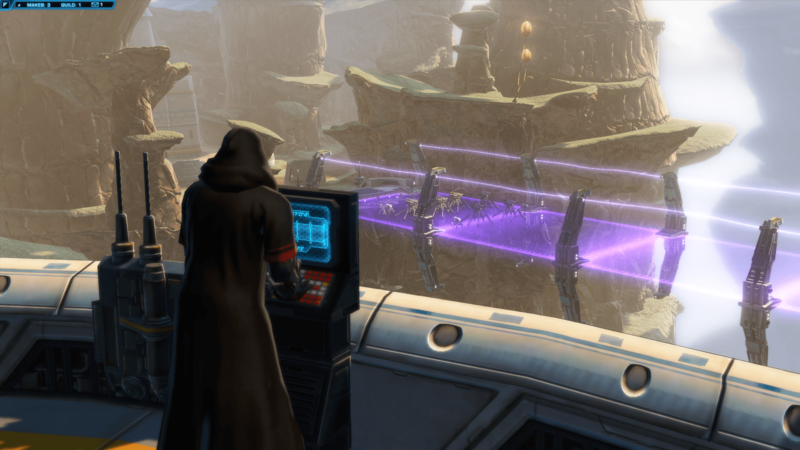 Another big thing that I want to do at some point is pick up where I left off in SWTOR, and play through the Reven content that I never actually got around to doing. I have this feeling at least in the near future that I am going to be focused on story games, less than I am going to be on raiding and grouping activities. The Final Fantasy XIV 3.2 patch might change that, and in part I hope it does…. because I would love to feel the drive to play that game again. However in the meantime I am going to quietly be piddling over here without my voice. This morning I attempted to get myself back in line for the impending work week, and I have to say the experiment has been a dismal failure. I normally get up for work at 5:30 in the morning, and then get up… do my routine and finally knock out a blog post. Sundays have always been difficult because generally speaking I am up until at least after Midnight and often times 1 am working on the AggroChat podcast that I end up having to finish editing and posting in the morning. Last night I was up until around 1:30 but thought it was probably a good idea to set an alarm. So at 7:30 I at least put toes on the ground…. and sat there teetering on the edge of the bed for a few minutes trying to decide what step came next. I finally realized that hoping in the shower was a good idea, and did that hoping that the water would somehow jog my brain into functioning enough to go through the rest of the morning boot up routine. I had decided yesterday that instead of having a yummy bowl of cereal in my warm home…. I would get out and find something in the cruel cold world to call breakfast. This ultimately meant that I would go outside and scrape the vehicle since apparently over night the temperatures had dropped a bit. So I consumed my breakfast and a big tall monster zero…. and played the fun game of trying to throw my muffin wrapper away. I say its a game… because my kitten for some reason LOVES muffin wrappers. She will literally go dumpster diving through my trash can trying to get it, only to drag it out from the bottom of the bin…. carefully unwrap the plastic bag I threw it away in and unfold the muffin wrapper so she can lick it. She is a damned determined cat and the second I leave the room and let my guard down…. she strikes and before I know it she has the damned wrapper out again. This will be something that continues over the next several days. The long and short of all of this…. is that tomorrow is going to be pure hell. I am dreading going back, not because there is something there that I dread necessarily… but that twelve days off from work is more than enough time to completely destroy any routines you have had. Many nights it might be two in the morning before I finally get to sleep… which is not exactly conducive to a 5:30 alarm clock. The goal is to have forced myself to get up earlier than normal this morning, and to stay up all day long regardless of how tired I might be…. in the hopes that I will get a nice full night of sleep tonight. I feel like it is not going to go anywhere near as well as I might have hoped. This break has been the one of binge watching content, and while most of it was Star Wars… we did manage to watch a new Netflix series called Making a Murderer over the last few days. Apparently my wife’s friends had been talking about it, and when she said they explained it as “like Serial” I knew I was in for the ride. Serial was one of those things that I got in on late, but I still dutifully listened to the show over the course of a few days while doing other things. The only problem with content like this, is that it does not wrap up neatly in a box at the end of the experience. In a “crime drama” at the end of the show you have some grand exposition that explains how it “really happened”, but real life is never that neat. Serial more or less was a show that made me wonder if this kid did what the police said he did, but it never made me physically angry at the police. I could see their side of the tale and I could see the kids side of the tail… and the end result was you mostly trying to sort out what you personally believed in the mix. “Making a Murderer” on the other hand presents a tale so frustrating that it ended up with me yelling at the screen several times, and my wife having to talk me down. I am not sure how much I can say that won’t give the entire tale away, because I feel like it is probably best to just watch the 10 episode series for yourself. There are however lots of moments that swayed me to the side of the supposed killer. I feel like he was most definitely not given a completely fair chance in this case, and there is a significant amount of bias in the area against him. There were several incidents that occurred that were never explained… like one of the police officers running the tags for the Jeep two days before the victim was reported missing, but after she WOULD HAVE BEEN missing. The recorded dispatch call sounded as though he was staring at the vehicle reading the plates off, and verifying that it was a jeep. Don’t get me wrong… I know a lot of really awesome police officers, but I also know some that probably would not bat an eye at planting evidence to support their case. The thing is… I believe at no point did anyone think they were framing an innocent man… but instead that from the moment his name was mentioned he was already assumed guilty and they began trying to make a case against him work. I think that is probably the worst thing that the show highlights is how non-existence the burden of proof really is. Maybe I am just more questioning of information… but I had more than enough “reasonable doubt”. Last night we recorded our AggroChat podcast devoted to Fallout 4. More or less this was the reason why I pushed through the storyline recently, and I have to say forcing myself to complete this game was one of the more miserable experiences. I wanted to be able to talk about story plots, but part of me thinks i would have been happier if I had just not done that. Bethesda games in general for me are about the little moments, and not the big picture. This is a game that delivers in spades when it comes to little vignettes, but fails to deliver when it comes to giving me a larger story arc that I really cared about. The biggest problem for me at least was the fact that in no way could you complete the game in a fashion that did not end up with completely closing off all of the other options. I hate red versus blue situations… and even though fallout 4 was red vs blue vs orange vs green…. it still set up an artificial conflict that I had no way of mediating. There were no “grand bargain” options but instead a lot of “nope they will hate you now” paths you were forced down. All of that said… the game itself was really awesome and I highly suggest it. When we finally do the game of the year show, this is more or less going to be my pick. I love the game, but then again I have loved every Fallout game to date…. well except Tactics… we don’t talk about Tactics. It was awesome and interesting hearing everyone elses options on the game as well. When we got to recording the show neither Ashgar or Kodra had managed to beat the storyline… and I think I probably would have been far happier if I had joined them in that club. Dallian on the other end of the spectrum had gotten 100% of the PS4 trophies, meaning that he had quite literally gotten every ending possible I believe. The takeaway is… this is a Bethesda game. If you like those games, then you are absolutely going to love Fallout 4… and more than likely you already own it and are happily playing it. If you don’t like Bethesda games, then this isn’t the departure you are looking for. If you are on the fence… then wait for a sale and try it then. If you’ve never played a Fallout game… I highly suggest you pick up Fallout New Vegas because it pretty much represents some of the best storytelling in the series. The show itself is full spoilers so if you plan on playing Fallout 4 at some point, and if you are one of those people for whom spoilers mean something…. then you probably should skip the show until a later date. Pause in loading gave a rare screenshot opportunity. 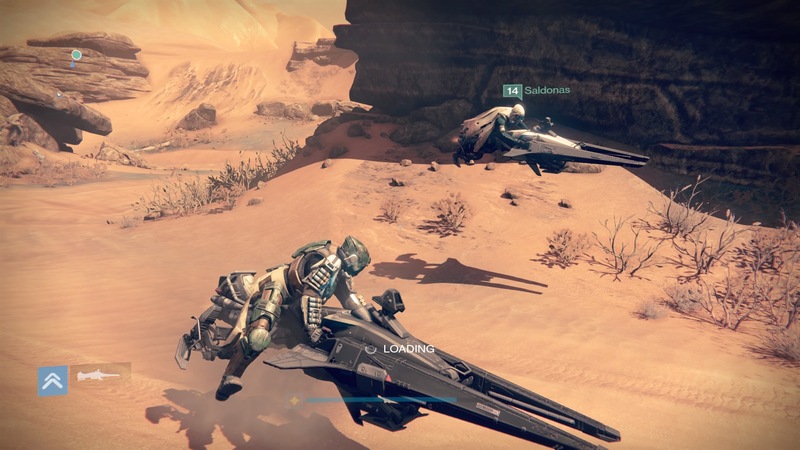 It seems my recent Destiny addiction has rekindled the fires in a handful of my friends. 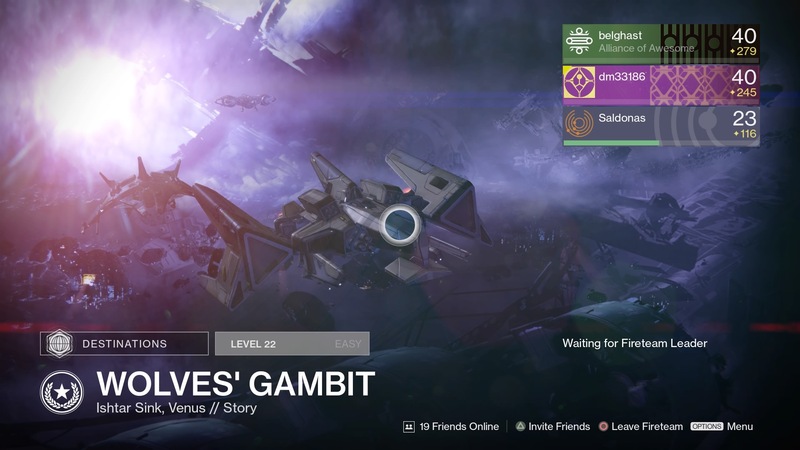 As a result over the weekend I spent most of it in a Fireteam with Damai attempting to help level our friend Carthuun represented above by his PSN name Saldonas. Saturday night my wife was freezing, so I got drafted into going to bed the moment our podcast broke up to provide “warmth”. As a result I had to spend a good chunk of Sunday morning editing the podcast, creating the YouTube version, blogging about it and broadcasting it to the world. After that I of course has to throw out my own Aggronaut post… which means that I was fairly late getting started on playing anything. By the time I logged into Destiny Damai and Carth had a fireteam going and were working on the last few missions of the original storyline. From there we pushed through The Dark Below and House of Wolves expansion content as a group, which honestly had been a bullet point that I wanted to get through at some point. The problem is with so much new and exciting stuff to do and gear to get… I never quite got around to making the time for it. However with Carth leveling for the first time… all of the items you get through those storyline elements were actually relevant. I finally st0pped grouping around 7pm when my wife got back home, and I went off to fix dinner for the two of us. At that point I think Carthuun was sitting around the level 25 mark which is not too shabby for a day of grouping. The big thing that I sorted was how to use PS4 party chat comfortably. I have a Logitech G430 sitting relatively unused because after swapping to using a Blue Yeti microphone on my machine upstairs, I swapped to simply using a pair of Behringer HPS3000 studio headphones. The sound output was better and they are nowhere near as heavy as the Logitech pair because they don’t need an attached boom mic. Ages ago I ordered a few pairs of adapters that take a standard headset and converts it down to the single jack style input that modern phones and the PS4 controller uses. Yesterday I took the time to dig out my G430 and one of those adapters and after some fiddling and piping all of the game audio through the headset… I finally arrived at something that was fairly comfortable to use. I don’t seem to mind the fact that playstation chat is mono audio… when I have the rest of the game audio coming through my headphones as well. Additionally having something other than my dedicated PS4 headset… makes them far more comfortable to use for several hours on end. Also this finally allows me to crank up the game audio without frustrating my wife, who has on occasion asked me to turn it down when a really crazy moment happens and the audio is booming. Now that it is sorted I feel more comfortable using a headset with the console, and am also more likely to just hang out in party chat for awhile. I am wondering what the upper bound on a party group is, and if you can have more than just the three fire team members. When I got downstairs last night to prepare for the season finale of Fear the Walking Dead, I of course booted up and started playing Star Wars the Old Republic. Now that I have finished with my smuggler, I am picking up where I left off on my Sith Warrior. Through the course of the evening I worked my way through the rest of the Nar Shadda storyline and just now starting on Tattooine. I have to say it is very nice to finally have all four buffs after beating one of each base class. I am a bit saddened however that I am finally reaching the stage of the game where it feels like having a healer is a very useful thing. This means relegating Vette to crafting and spending the majority of my time with Malavai Quinn. In the grand scheme of things I have no problem with Malavai, because he seems like the honorable Imperial Soldier type. The problem being that I just like running around with Vette, because I always loved Mission Vao, and honestly for me… she was always Mission 2.0 rather than her own character. Instead she will farm up companion gifts… that I will ultimately give to her later… which seems a little strange? Basically if I have a shot in hell of getting the special legacy unlock thing for beating all of the stories, that means I have to play through the rest of Sith Warrior, Imperial Agent, Bounty Hunter, and Sith Inquisitor all before the end of the month. I am seriously doubting I will be able to do it, but…. that said if I ONLY focus on the story missions I might be able to make it. When you only focus on the class story the early planets at least go extremely quickly and you stay at a decent level. I might need to spend some cartel coins however to unlock more mod gear to throw on my characters. The plan I arrived at on my smuggler of upgrading my armor every other planet seemed to work pretty well and I would really like to do that with my Sith characters. The problem being the game is not extremely forthcoming with armor options. There are sets available for pretty much any level range on the Cartel Market, but each of them cost a fair amount of coin. So I guess we shall see what ultimately happens. I guess if I got desperate I could make them wear the free moddable flight suits they give you, but that is not exactly a great option. I might use the imperial pilot suit for Malavai Quinn however. The funny thing about AggroChat is that in the grand scheme of things… we don’t actually get that many listeners… or at least not enough listeners to go through the trouble of some of the things that I do. For example… our YouTube videos maybe get a dozen views a piece. That said I like doing them, and I am not sure why. I guess they are just far easier to link to someone when they ask you about the show than linking the actual podcast page. Also I like embedding a youtube video far more than I liked embedding the Libsyn player. I feel like I could probably do better about advertising our show. I tend to do it in a rather haphazard fashion, because I feel rushed to get each show out the door and ready. By the time I finish editing, uploading, and doing all the other things… I reach this point where I just want to be done with it for another week. It is not necessarily the most enjoyable period of my week. I love making the show, but the tedium that comes from doing all the fiddly bits to make it happen… gets annoying. So I reach this point where I just want to hurl it out into the world and hope someone finds it interesting. The hardest part is it feels like we don’t have a lot of feedback. Podcast listeners tend to listen silently, and while we have a few people that comment here and there… you don’t get the sort of commentary that you do when you have a blog. There are weeks however like this week, where I feel like we got into some extremely interesting conversations, and it is well worth listening. I love the folks I podcast with, because ultimately they are the folks that I hang out with on a daily basis. I have a distinctive grumpy this morning. For starters it is raining and storming… and I cannot pull the covers over my head and allow myself to be lulled back to sleep by the rhythmic noise. Secondly I was up far later than I expected last night. but that in itself wasn’t all that out of the ordinary. However roughly 45 minutes before the alarm was set to go off, our kitten using some of her newly discovered jumping abilities caused an avalanche to occur sending a ton of crap falling off of a high perch. Instead of just accepting my fate and getting on up, I did the futile thing and attempted to go back to sleep. So I am going through that sluggish phase when you have attempted to get sleep… but didn’t get enough of it. As such my mental processing is a bit sluggish, but the show must go on. Coffee is being consumed, and hopefully that will fix all the wrongs in the world… or at least lessen them. As to last night… I was up late in part due to a bout of insomnia and in part due to doing things with friends. I wrote the other day about my process of working through the HK-47 storyline, and over the weekend Tam managed to get caught up to the same place I was. As I was folding laundry last night, I got a text asking if I was around but I didn’t actually see it until I was headed upstairs to wait out my insomnia. There are a whole lot of faffing about that you have to do, which involves going to planets and scanning for HK-47 parts. After that however you have two dungeons… the first one being a normal mode False Emperor and the second being a hard mode Maelstrom Prison. We managed to get four warm bodies, which included a tank and three dps… but unfortunately our only healing option had to go to bed early. Since all of us were between 56 and 57 in level we assumed we would be able to do the normal mode dungeon without much issue. While I managed to get a little low a few places, False Emperor went off without a hitch and we even managed to get a few cool cosmetic pieces. Still feeling brave we decided to go ahead and attempt Hard Mode Maelstrom Prison without a healer… and while I took a few deaths due to my own stupidity… we managed to make it through that dungeon as well. So in theory… we can likely run any of the older content without heals. The cool thing is that while we were running the place we managed to get housing items to drop… which makes the place far more interesting for repeated running. I think tonight I can run the last part of the HK-47 chain, which is a return to the Heroic 2 dungeon from the very first of it. I simply did not have the oomph to remain awake last night and push through it. 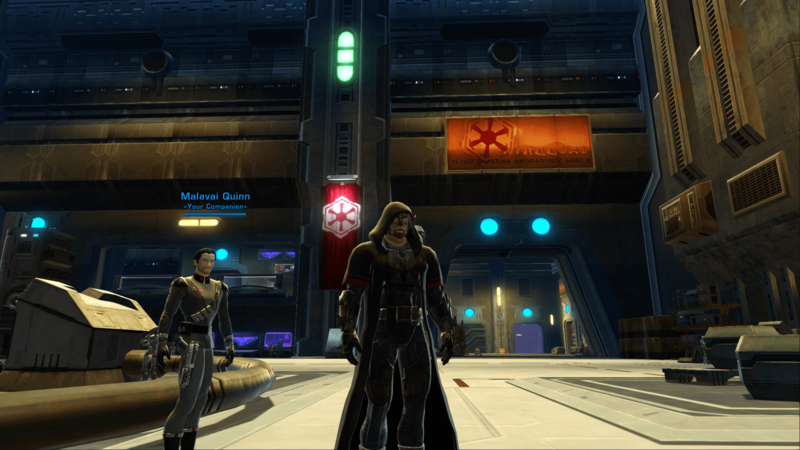 I spent most of yesterday chasing Skavak across Coruscant on my Chiss Scoundrel. I am having quite a bit of fun playing the smuggler right now, and it is really the only class that I did not spend a significant amount of time playing during release. Before leaving the game I had managed to get the Jedi Knight, Jedi Consular and Trooper all to level cap, and had several failed starts and playing the smuggler. This time around I decided to go for the “sawbones” spec, which now does more than it previously did. The Scoundrel subclass was a confusing mess because I personally struggled trying to figure out what abilities I should be using. Previously you got this mix of melee focused and ranged abilities… and it seemed like a horrible idea to be a melee healer in this game. Instead they have taken out all but the crowd control melee abilities and give Sawbones a focus on ranged damage to mix in with their healing. This combined with switching to Treek as my tank over Corso Riggs has ended up making for a much more enjoyable experience. 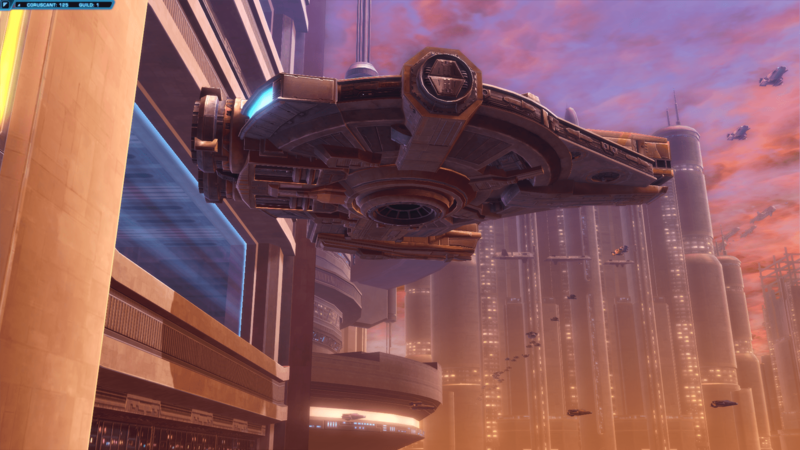 Towards evening I blasted out of the space port on Coruscant headed for the wasteland of Taris. Now that I have dinged 21, I spent some of my hard earned commendations and kitted out both my armor and that of Treek in full level 21 modifications. I am pretty damned happy that I have orange sets of gear for both, and my theory is that I will upgrade at the end of each planet, hoping to soak up enough commendations while on the planet to be able to kit out my gear each time. The truth is with the experience bonus I am well ahead of the curve. Taris for example is originally intended for level 16-20 players… and I didn’t even make it onto the planet until 21. My hope is this is going to allow me to be able to complete some of the heroic four content, and get more commendations that way. In theory I think the heroics are daily quests, and I could keep going back to Coruscant to do those in order to soak up a few additional commendations. In any case I am really enjoying myself, and this has been a welcome diversion. My hope is that we can muster some grouping again over the next few days and explore some of the flashpoints that we never saw. While this is a long shot, it would be kinda cool to be able to see some of the operations as well. 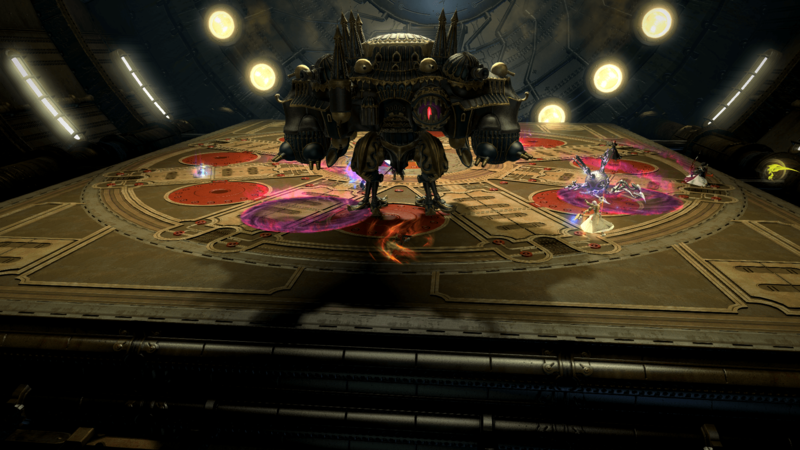 Tonight however… we are going to work on taking down Ravana Extreme. Yesterday I decided to try something slightly new, and failed a little bit along the way. I had noticed that many podcasts actually uploaded their shows to YouTube, by simply throwing up a static image with the audio running behind it. I figured this couldn’t hurt, and for some people YouTube might be a more comfortable experience than having to set up podcast software. The first attempt however lacked any audio at all. I was using Adobe Premiere for the first time, and as a result ended up exporting in some strange format that was a combination of a video file and a waveform audio file as well. Windows seemed to know what to do with the file, and when I tested it… it appeared to play just fine. However upon uploading it… I got a really long still image with zero sound kinda defeating the purpose. The second export however made it just fine, and we now have our first YouTube show up. We’ve already gotten a few views so we will see how this compares to the podcast. It might also make an easier format for folks to comment on. Let me know what you think. I doubt we will ever do a video show like Cat Context and The MMO Show… but for the time being it gets our show in another medium. As you could probably tell from some of the subtext of my posts this week… it was a pretty rough one for me emotionally. Work is still being stressful, but honestly that really had nothing to do with this one. For our country September 11th has some pretty tragic context, but for me it has completely different issues. Firstly September 11th was the birthday of my grandmother, and she would have been 90 this year. I miss her an awful lot, and there are days where it is just rough to think about her. Her birthday always brings back memories of her, which are honestly all good… but there is a bittersweet melancholy associated with it. She essentially raised me during the first years of my life, because she was my constant babysitter and companion. She is also the one member of my family that really seemed to appreciate my wife being a member of the family. If that were not enough to get me down in the dumps… this week also marks the anniversary of a pretty horrible period of my life. In September of 2012 I lost my Grandfather, and the day after the funeral… September 11th… a pretty horrific event happened at my work place. It quite literally with zero hyperbole ushered in the worst six months of my life. Someone screwed up, and screwed up badly… and I had to deal with the fallout and recovery. So each time this day comes I get a little gun shy. So this past Friday I was crawling in my skin as I waited for they day to end. As far as gaming this week, I had a pretty cloistered time of it. I am still very much in my “hiding out” mentality, and I guess in part I think it was just me waiting for this week to pass me by, dreading Friday. I spent some time working on my Demon Hunter in Diablo 3 and I think when I last played I was about halfway through 69. At some point soon I hope to pop back in and finish leveling him to 70. 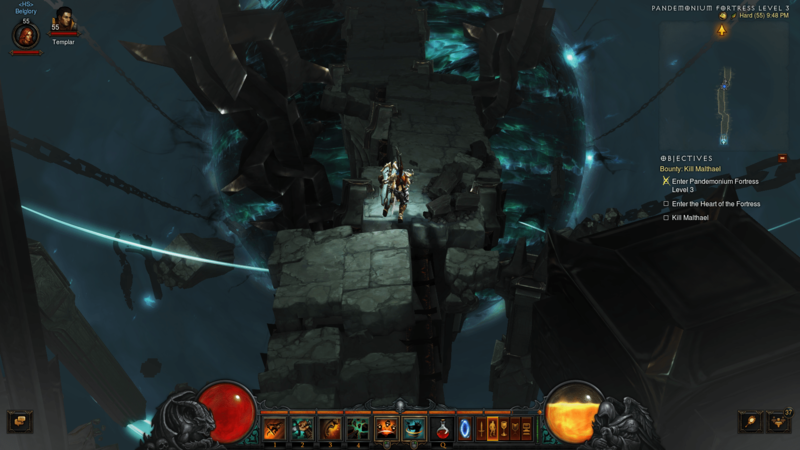 I also spent some time farming away on Rifts, Greater Rifts and Bounties attempting to get blood shards… which I then disappointingly spent trying to get class set pieces. I have been stuck at 3 of 4 pieces of the set I am going after on my Barbarian for a few weeks now. I am not sure but Diablo might have worked its way out of my system for a bit. I finished off the seasonal stuff, but as of last night Grace on the podcast talked about additional seasonal rewards. I am just not sure if I will be willing to do any of the crazy things that are required to get them. The big event of this week was that I apparently have fallen into a Star Wars the Old Republic shaped hole. I have played this game off and on since release, but this is really the first time I have felt I was actually back in the swing of things. I’ve played alts a lot in the past, but this is the first time I have actually continued the storyline on my Jedi Guardian main. 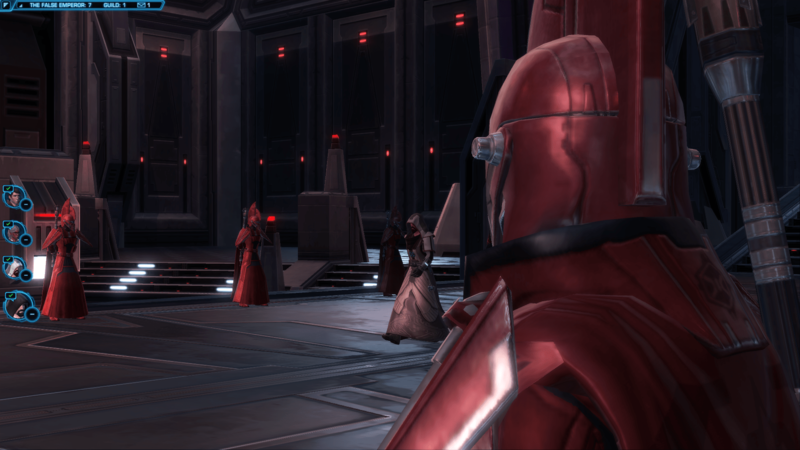 As of last night I finished Makeb and am working through the precursor content leading up to Shadow of Revan. My plan is to finish the story content before the drop of Fallen Empire next month. Additionally I am taking advantage of the insane twelve times experience bonus. Last night during the podcast I started working on my Chiss Smuggler and I have to say… having access to Treek as a tanky companion makes that experience so much better. Seriously… I hate Corso Riggs so much… and was completely stalled out trying to play a smuggler because he annoyed me so much. Treek is simply a better tank.. in that she jumps AT the mobs instead of grappling them back to me. Who though a tank companion pulling back to the healer was a good idea? Anyways as soon as I wrap this post I intend to go downstairs and play some more Smuggler… that was how much I was into it last night. I may or may not have stayed up until 1:30 in the morning playing. I am very much in a lull right now with Final Fantasy XIV. I talked about this a bit on the podcast, but it is strange… that even while in this lull I still consider it my home base of operations. I figure when 3.1 lands which should be soonish… everyone will be invigorated once more and we will return to logging in every single night. In the mean time I am playing a lot of other games as not to force myself. I am still raiding on Monday and Wednesday nights, and this week we managed to get a few more people through Bismarck Extreme. I really want to defeat Ravana Extreme before the new content lands, but one of the big problems we are having is… that honestly it just feels like there isn’t much content for us to be doing. When we returned to Final Fantasy XIV July 2013 we had a years worth of content to explore since we had last played. While we managed to slowly whittle our way through all of it… it gave us tons of small goals to work towards. In Heavensward there really does not seem to be the much for us to work towards. We can clear Alexander Normal in our sleep, and are pretty successful with Bismarck Extreme. We are working on Ravana Extreme and I believe it is in our sights… but Savage Alexander just isn’t a realistic goal, namely because I can’t bring myself to do the gear grinding that it would require to really be viable there. I am well enough geared to do all of the content I feel like I could do… and I just don’t have the drive to push towards that bleeding edge. So instead I play other games and wait for another content drop. This week turned out to be a shockingly stressful one, but thankfully all of said stress happened at work… and I could more or less leave it there as well. There has been a twinge of sadness as well because months ago I had hoped to be able to attend Pax Prime and get to hang out with friends there. However that didn’t quite work out, and since I lacked tickets to go there… because AggroChat was not apparently qualified as a media outlet, I stopped pushing quite so hard. The beginning of the school year is especially rough on my wife, and it would have been even more stressful to be travelling during this time. As such I am doubting that Pax Prime will ever really be in my cards unless for some reason they decide to move it either earlier or later in the year. I will always have Pax South however, and I fully intend to go this coming year. I am going to be trying to talk as many people into attending as I can, and hopefully can organize a meetup or something while there. There were plenty of people at Pax South last year but I was completely overwhelmed by it being my first real convention, and the internet was pretty horrible… so I missed most of them. Anyways… on with what is I hope becoming a Sunday tradition, where I review the games I played over the past week. 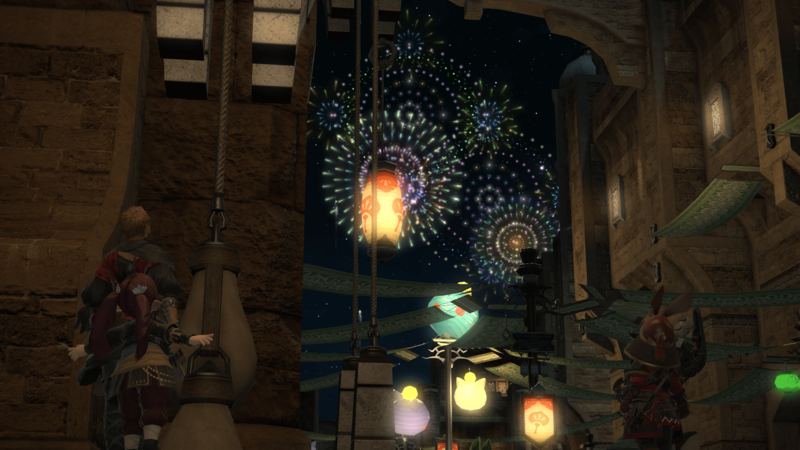 Currently “The Rising” event is going on in Final Fantasy XIV that marks the yearly anniversary festival. This year the quest that goes along with it is one of the most touching quests I have experienced in a game before. I don’t want to spoil too many details about it, but suffice to say there is a little bit of fourth wall breaching going on. Diehard Final Fantasy XIV fans have this hero worship for Naoki Yoshida and the rest of the team, and it is absolutely well earned. It feels like there is very much a symbiotic relationship going on there, and they understand fully just how important the loyal fans are to the continued success of the title. The game is in this interesting place where it is extremely humbled by the fact that it launched in 2010 and failed to capture hearts and minds. They are putting everything into the game and leaving nothing on the table, and it shows. Other than the anniversary event we worked on Ravana Extreme attempts, and I have every hope that we will be able to down him this coming Monday. Past that I have honestly been taking a bit of a break from Final Fantasy XIV, or at least not really logging in every day. 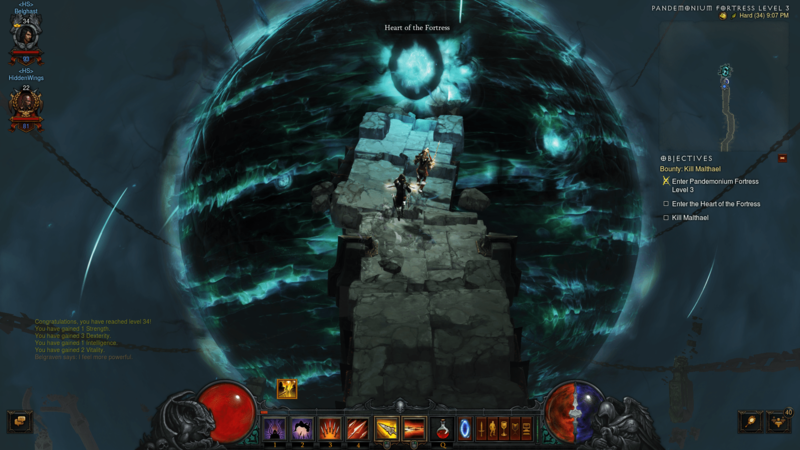 If you are wondering where the bulk of my game time was spent, you can look no further than Diablo 3. I am not sure if it was my time playing Hellgate London, or the fact that I finally pulled my head out of the sand and realized there was such a thing as a “season”. Whatever the combination I have been pumped to be playing Diablo 3 again and have been spending a lot of time with my friend Grace was we worked on pushing up our seasonal characters. At the beginning of the week I managed to get my Crusader from last season to 70 with the help of Grace and her crazy torment farming ways. Then Friday when the new season opened I started work immediately on a female Barbarian. As of last night I am now level 60 and making the final push to 70. That is really what I intend to spend most of my time today working on, and hopefully by tonight I will be sitting at 70 and starting to work on gearing up for doing torment and beyond. I am having a blast, and I am not sure whatever mental block cleared that has allowed me to get involved once more with the click to attack madness. I can’t say that I have made stellar progress since last week, but I am continuing with my new tradition of trying to play Wildstar Tuesday nights. At this point I am level 25 still in Whitevale but I think maybe I can see the end of the zone. My hope is to move on past it this week and hopefully into something less desolate. I feel about Whitevale the way I feel about most desert zones in MMOs. I have come to realization this week that it is never the biome necessarily that I like or dislike, but instead the zone design. I was warned that Malgrave is coming up, and a desert… but from what I have seen of the imagery inside it seems like something I will enjoy. I want to devote more time to this game, but for now I am going to settle with making it a Tuesday night thing. The game that I played that shocked me the most this week was Hearthstone. I have not really spent much time playing it since release, and with the addition of a new expansion of cards I decided to poke my head in. 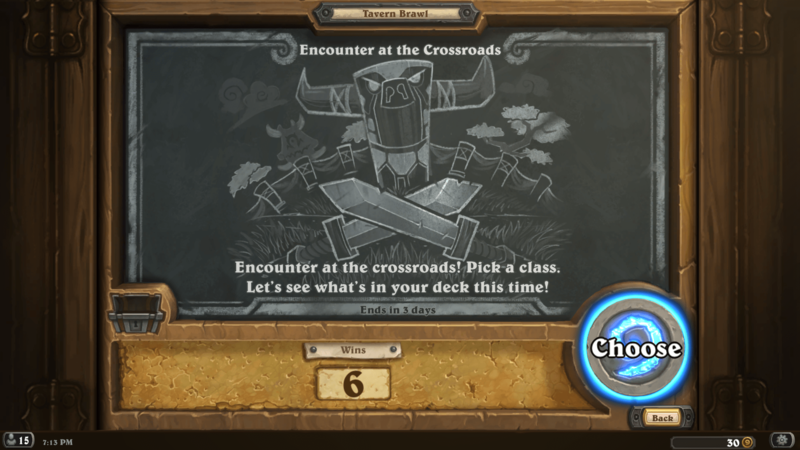 This is where I found a brand new game mode called Tavern Brawl. Apparently you have a different weekly challenge, and this week was essentially playing with a randomized deck. I played hunter and had a good amount of success. Playing with a random assortment of cards, including many of the brand new Grand Tournament cards gave me a nostalgic feeling much like the early days of Magic the Gathering. I used to love the days when I was limited based on the cards I physically owned and as a result made some odd decks to try and weave in my favorite elements. In truth I would probably play Hearthstone more often if this random brawl option thing was a fixed item. I know this coming week there will be a completely different Tavern Brawl, but I will likely poke my head in to see what it is and give it a shot. This might breathe new life into the game for me, and for that I am kinda pumped. My week in review would not be complete without at least talking a bit about Fallout Shelter. Now I have been technically playing this game for awhile now but since I do not regularly use my iPad, the sessions were limited and I went weeks between opening the app. With the release of Fallout Shelter for android I have been playing it far more often on my phone, and it has now become my default “moment of downtime” game as I check in on my little post apocalyptic ant farm. All things said I learned a lot of lessons playing it on the iPad that I have now applied to this new vault. Where Vault 999 was a relative failure, Vault 861 is pretty damned idyllic. Through a bit of luck of drops, and some careful planning I have managed to create a pretty safe environment that can absolutely shred raider attacks. I had a random person show up at the vault that was fairly warriorly, and once I equipped her with power armor and a plasma pistol she has been roaming the wastes dispensing justice. At the same time she has become a major source of income and the gear she brings back I am slowly outfitting all of my settlers in. I have jokingly started calling the restaurant on the first floor Cafe Death, because the raiders always go there…. only to get shredded by all of my shotgun toting vault dwellers. 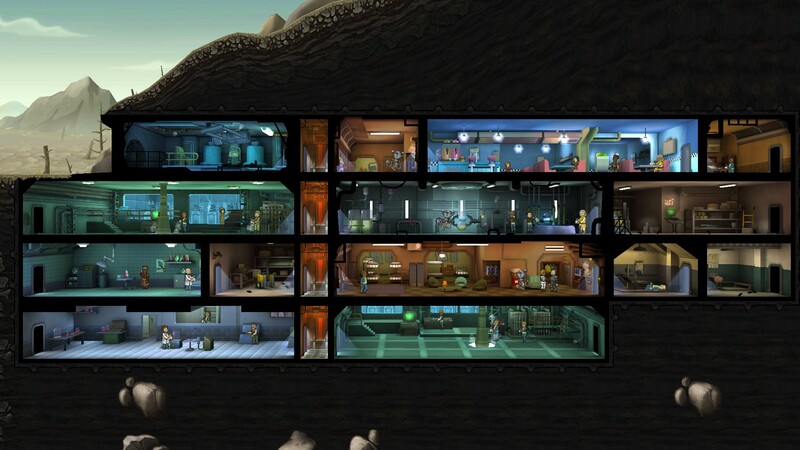 The only thing that I feel bad about is that I essentially have one couple that is slowly populating my vault. I have left them in the room for weeks now and they have half a dozen offspring roaming around as a result. 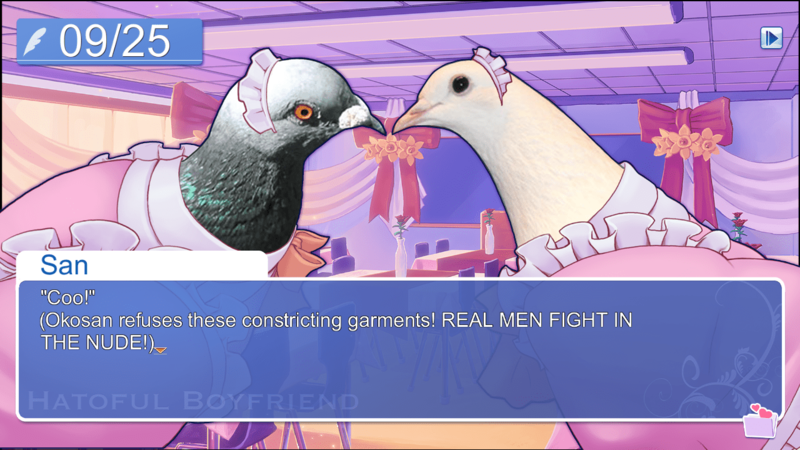 The last game that I played a significant amount of this week was of course Hatoful Boyfriend, and last night we recorded the AggroChat game club show for it. This was Grace’s pick and I think a lot of us went into this assuming that we would end up hating the game. We were mostly wrong as the vast majority of us had lots of good things to say about the game. To make it even crazier this is the first game that the majority of us have actually played through more than one… but given that an individual play session tends to only be around the hour long mark that makes sense. If you want to hear our length discussion about dating “Birbs” after the apocalypse you should totally listen into the show.